Y-Cam is a security setup that employs a bunch of little peripherals under the one hub to give you peace of mind when away from home of when you locked everything up for the night. 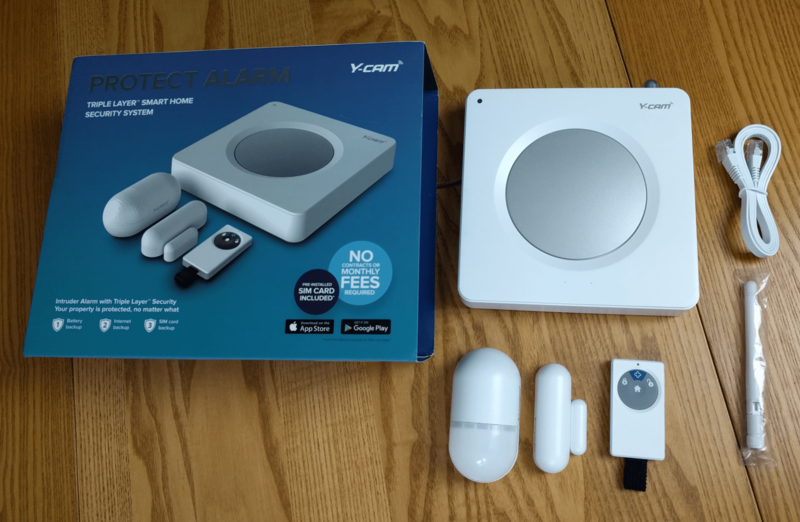 Here we take a look at the Y-Cam Protect Alarm system. A basic, starter kit that notifies you when something happens in the home. First up is the alarm hub itself. This box looks like an alarm system, is large enough to act as a deterrent however it’s designed to plug into your route so it might have some limits as to where you can place it. The Hub has some holes on the back for screws to allow wall mounting. Also is the box is a door sensor with some adhesive tape to attach to both the door and the door frame. A motion sensor and remote control are also included. The Y-Cam Protect calls itself a “Triple Layer” security system. This uses wired, wireless and SIM card to protect your home if your internet or power is cut. In order to use the third level, the user has to pay for the SIM service. This costs either £5.99 per month or £59.99 for the year. The SIM provides alarms to the application and text messages to your phone when the alarm has been triggered. There is also a feature to include the Plus button on the remote to send an emergency message to two mobile numbers. If an elderly relative has fallen perhaps, they can summon help if they have the remote on their person. The battery on the Y-Cam lasts for around eight hours, this would be handy if there was a power cut and house was broken into a few hours afterwards. The motion and door sensors are battery powered and are said to last a year before needing replacement their batteries replaced. The sensors work for the most part. Testing the motion sensor was a little deflating as I was able to wave at it in the dark from a meter away without it jumping into action. During the day it was triggered by my pets and unlike my main house alarm does not have a function to disregard differing weight categories. However, it’s cost £150, my house alarm was close to £1000 and only upsets the neighbours when it goes off instead of tapping me on the shoulder to tell me my phone collection might not be there when I get home. You can also arm or disarm from anywhere by the application. Whilst the Y-cam isn’t loud enough to annoy the neighbours on a false alarm it would probably aggravate your dog/cat that set it off in the first instance. When armed the hub announces that it has been armed before allowing an adjustable grace period to clear the area. Setting off the alarm is an odd experience. The bell inside is loud, but not pant wettingly loud. You neighbours are unlikely to investigate and the sound may only serve to alert an intruder that something has happened. Instead, notifications will fly out to your device for you to react to. The Y-Cam app is available for both for iOS or Android and is relatively simple to use. There are not many options, however, I would imagine as you add more peripherals to the system it would become a lot busier. Whilst I do not have the addition camera the functions are available to give a taste of how I could enhance the system if I were to feel inclined. The Hub settings have a large amount of customisation making for quite an attractive experience. From naming sensors and items on the Y-Cam system to checking signal, there is a lot to work with, however not all is necessary when you are just plugging in and wanting it up and running. The Protect system works pretty well. The remote is useful however I found using the application a lot more useful. I couldn’t help but think that the remote would really only be for the elderly. It’s not something you would attach to your keys when you go out and oddly enough it sat beside the Y-Cam hub for most of the time, so I didn’t lose it. The Protect function arms and disarms quite quickly and the app is updated quickly when something happens with the system. One afternoon I did encounter a problem with the app when I received an error stating “regld required” however it worked later. The Y-Cam Protect is a good-value home alarm system with an extra layer of reliability. It’s easy to setup and use with the benefits that easily outweigh the shortcomings. The subscription fee has it merits however it might not suit everyone.